Civil Ceremony Flowers are always beautiful from Rose and Grace. Thank you so much for the fantastic flower displays and bouquets you made for our Civil Ceremony! 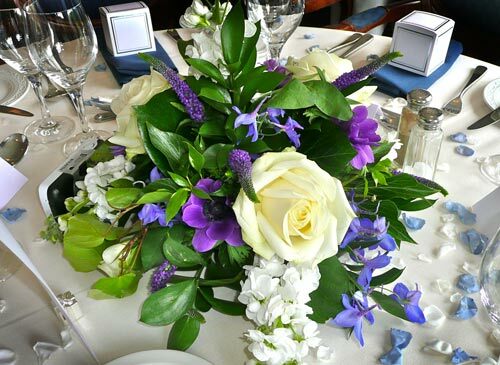 It really put us at ease straight away when you said blue roses wouldn't be a problem....We had lots of positive comments from our guests....many took table decorations home with them - even The Springs asked to keep the larger displays! 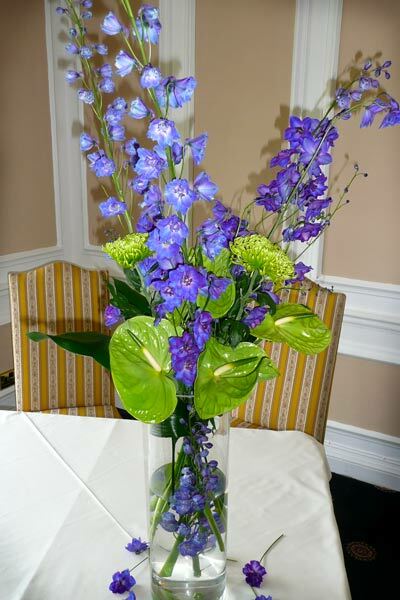 Catherine Young is a florist who can interpret your ideas into beautiful designs that will surpass your expectations and help to make your day work so well. Here is an example of Civil Ceremony flowers that we did on for Cat and Tina on a beautifully sunny spring morning that promised a great day ahead. Button holes for Cat and her parents were delivered to their home first thing. 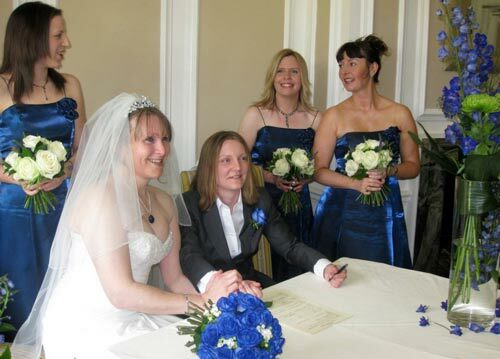 It was then straight on to The Springs Hotel in Goring - a beautiful Tudor-style Victorian country house, built in 1874, now licensed to hold civil ceremonies. Cat and Tina's whole look centered around dramatic blue roses. 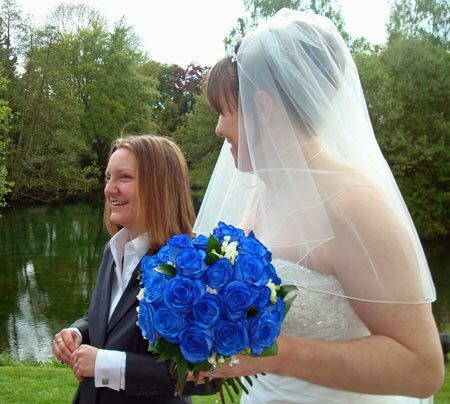 These unusual blue wedding flowers had been conditioned previously, with all thorns removed! The blue is arrived by dyeing white roses, of course, but they make the most dramatic colour, unobtainable any other way. Mixed with them were white bouvardia and purple spikes of veronica. 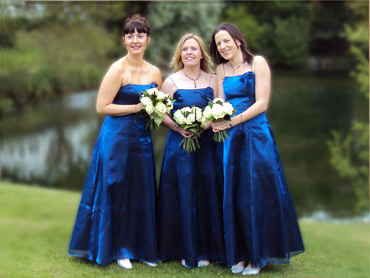 As a contrast to Tina's blue rose bouquet, her bridesmaids carried bouquets of cream 'avalanche' roses mixed with purple veronica. To find out more about flowers by Rose and Grace in The Cotswolds - in Worcestershire, Oxfordshire, Gloucestershire and Warwickshire - and further afield, please get in touch. Being very organised, we can deliver and help with setting up your ceremony and reception, with distance being no problem. To deliver a few miles needs our transport as well packed as to deliver 100 miles. 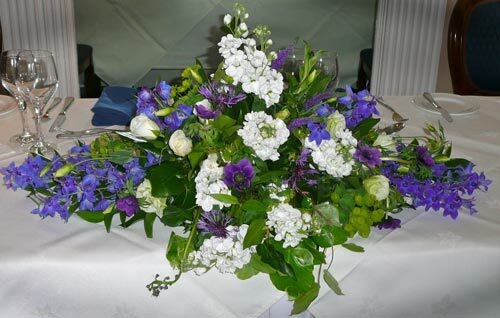 We would ask for a contribution to journeys over 20 miles, but in the scheme of things, it is a small part of the cost and the reassurance that you are getting help from one of the best florists in the country should override this if you want the best flowers and feel to your special event. Alternatively complete our simple Contact Form, and we will get back in touch as soon as possible.